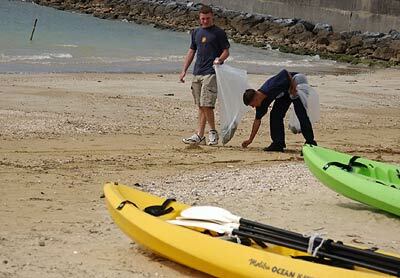 HENOKO, Okinawa, Japan — Marines of Camp Schwab and members of the Henoko Senior Citizens’ club joined together to beautify a portion of the beach here April 29. 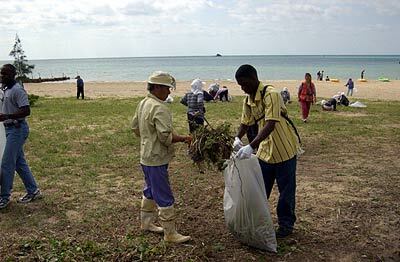 The clean up was part of Green Day, which is a national holiday and the first day of Golden Week, a series of Japanese national holidays. As an outdoorsman and nature lover, the holiday is a celebration of former Emperor Hirohito’s birthday and is a day reserved for working outdoors and cleaning the environment. 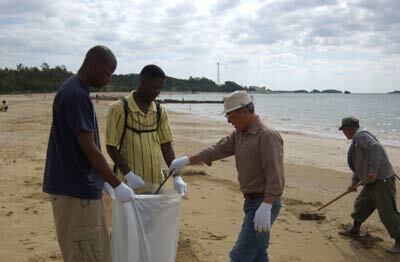 “It’s wonderful that we did the clean up on the Japanese holiday,” Oshiro said. With fifteen Marines and more than 50 Okinawans, the neighbors worked diligently for several hours removing trash, debris and overgrown vegetation. Bonded by environmental holidays, the Marines and senior citizens enjoyed one another's company. The senior citizens had a rare chance to see Marines in action on a personal level. “This was to promote that Marines are people too. We serve in a uniform each day, but we’re not just a soldier, we’re also trying to develop ourselves for when we return to society,” Standing said. Getting out and participating in community activities is a necessity, he explained. Once the two groups completed the task at hand, they took the opportunity to relax together, and see the beauty of their joint effort.